The art of the Meiji period (1868–1912) was marked by a division between European and traditional Japanese styles. The Meiji period (September 1868 through July 1912) represents the first half of the Empire of Japan, during which Japanese society moved from being an isolated feudalism to its modern form. During this period, western style painting (Yōga) was officially promoted by the government, which sent promising young artists abroad for studies and hired foreign artists to establish an art curriculum at Japanese schools. After an initial burst of western style art, there was a revival of appreciation for traditional Japanese styles (Nihonga) led by art critic Okakura Kakuzo and educator Ernest Fenollosa. In the 1880s, western style art was banned from official exhibitions and was severely criticized by critics. Supported by Okakura and Fenollosa, the Nihonga style evolved with influences from the European pre-Raphaelite movement and European romanticism. In 1907, with the establishment of the Bunten exhibitions, both competing groups—Yōga and Nihonga—found mutual recognition and co-existence and even began the process toward mutual synthesis. pre-Raphaelite movement: An art movement founded by a group of English painters, poets, and critics with the intention of reforming art by rejecting what they considered to be the mechanistic approach first adopted by the Mannerist artists who succeeded Raphael and Michelangelo. feudalism: A social system based on personal ownership of resources, personal fealty of a lord by a subject, and a hierarchical social structure reinforced by religion. Romanticism: An artistic, literary, and intellectual movement that originated in Europe toward the end of the 18th century and in most areas was at its peak from 1800 to 1840; partly a reaction to the Industrial Revolution, it was also a revolt against aristocratic social and political norms of the Age of Enlightenment and a reaction against the scientific rationalization of nature. The Meiji period (明 Meiji-jidai) was an era in Japanese history that extended from September 1868 through July 1912. This period represents the first half of Japan’s time as an imperial power. Fundamental changes affected Japan’s social structure, internal politics, economy, military, and foreign relations. Japanese society moved from being an isolated feudalism to its modern form. In art, this period was marked by the division into competing European and traditional indigenous styles. In 1907, with the establishment of the Bunten exhibition under the aegis of the Ministry of Education, both competing groups found mutual recognition and co-existence and even began the process towards mutual synthesis. During the Meiji period, Japan underwent a tremendous political and social change in the course of the Europeanization and modernization campaign organized by the Meiji government. Western style painting (Yōga) was officially promoted by the government, which sent promising young artists abroad for studies. The Yōga style painters formed the Meiji Bijutsukai (Meiji Fine Arts Society) to hold its own exhibitions and to promote a renewed interest in western art. Foreign artists were also hired to come to Japan to establish an art curriculum in Japanese schools. The Yōga style encompassed oil painting, watercolors, pastels, ink sketches, lithography, etching, and other techniques developed in western culture. Yōga style painting of the Meiji period by Kuroda Seiki (1893): Yōga, in its broadest sense, encompasses oil painting, watercolors, pastels, ink sketches, lithography, etching, and other techniques developed in western culture. However, in a more limited sense, Yōga is sometimes used specifically to refer to oil painting. After an initial burst of western style art, however, the pendulum swung in the opposite direction. Led by art critic Okakura Kakuzo and educator Ernest Fenollosa, there was a revival of appreciation for traditional Japanese styles (Nihonga). In the 1880s, western style art was banned from official exhibitions and was severely criticized by critics. Supported by Okakura and Fenollosa, the Nihonga style evolved with influences from the European pre-Raphaelite movement and European romanticism. Paintings of this style were made in accordance with traditional Japanese artistic conventions, techniques, and materials based on traditions over a thousand years old. Nihonga style painting: Black Cat by Kuroki Neko, 1910): Nihonga style paintings were made in accordance with traditional Japanese artistic conventions, techniques, and materials. While based on traditions over a thousand years old, the term was coined in the Meiji period of the Imperial Japan to distinguish such works from Western style paintings, or Yōga. During the Shōwa period, Japan shifted toward totalitarianism until its defeat in World War II, when it led an economic and cultural recovery. The Shōwa period in Japanese history corresponds to the reign of the Shōwa Emperor, Hirohito, from December 25, 1926 through January 7, 1989. Japanese painting in the pre-war Shōwa period was largely dominated by the work of Yasui Sōtarō (1888–1955) and Umehara Ryūzaburō (1888–1986). During World War II, government controls and censorship meant that only patriotic themes could be expressed, and many artists were recruited into the government propaganda effort. After the end of World War II in 1945, many artists began working in art forms derived from the international scene, moving away from local artistic developments into the mainstream of world art. Treaty of San Francisco: A treaty between Japan and part of the Allied Powers, officially signed by 48 nations on September 8, 1951 and coming into force on April 28, 1952; representing the official conclusion of World War II, it ended Japan’s position as an imperial power and allocated compensation to Allied civilians and former prisoners of war who had suffered Japanese war crimes. Surrealism: An artistic movement and an aesthetic philosophy, pre-dating abstract expressionism, that aims for the liberation of the mind by emphasizing the critical and imaginative powers of the subconscious. fascism: A political regime having totalitarian aspirations, ideologically based on a relationship between business and the centralized government, business-and-government control of the market place, repression of criticism or opposition, a leader cult, and exalting the state and/or religion above individual rights. The Shōwa period in Japanese history corresponds to the reign of the Shōwa Emperor, Hirohito (裕), from December 25, 1926 through January 7, 1989. The Shōwa period was longer than the reign of any previous Japanese emperor. During the pre-1945 period, Japan moved toward political totalitarianism, ultra-nationalism, and fascism, culminating in Japan’s invasion of China in 1937. This was part of an overall global period of social upheavals and conflicts such as the Great Depression and the Second World War. Defeat in the Second World War brought radical change to Japan. For the first and only time in its history, Japan was occupied by foreign powers. This occupation by the United States on behalf of the Allied Forces (which included the Soviet Union, the United Kingdom, and China) lasted seven years. Allied occupation brought forth sweeping democratic reforms, leading to the end of the emperor’s status as a living god and the transformation of Japan into a democracy with a constitutional monarch. In 1952, with the Treaty of San Francisco, Japan became a sovereign nation once more and underwent an economic revitalization. In these ways, the pre-1945 and post-war periods regard completely different states: the pre-1945 Shōwa period (1926–1945) concerns the Empire of Japan, while the post-1945 Shōwa period (1945–1989) was a part of the State of Japan. 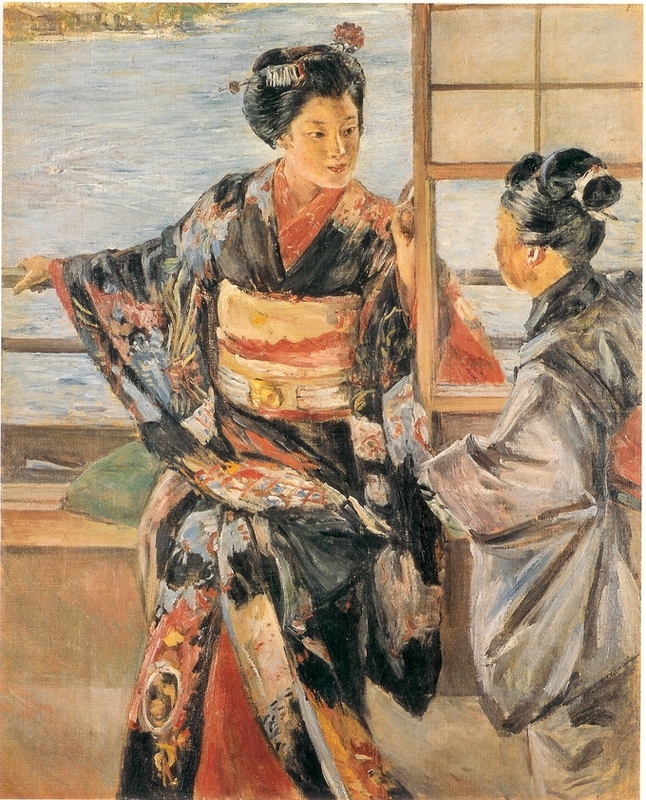 Japanese painting in the pre-war Shōwa period was largely dominated by Yasui Sōtarō (1888–1955) and Umehara Ryūzaburō (1888–1986). These artists introduced the concepts of pure art and abstract painting to the Nihonga tradition (a style based on traditional Japanese art forms) and thus created a more interpretative version of that genre. Yasui Sōtarō was strongly influenced by the realistic styles of the French artists Jean-François Millet, Pierre-Auguste Renoir, and Paul Cézanne; he incorporated clear outlines and vibrant colors in his portraits and landscapes, combining western realism with the softer touches of traditional Nihonga techniques. This trend was further developed by Leonard Foujita (also known as Fujita Tsuguharu) and the Nika Society to encompass surrealism. To promote these trends, the Independent Art Association was formed in 1930. 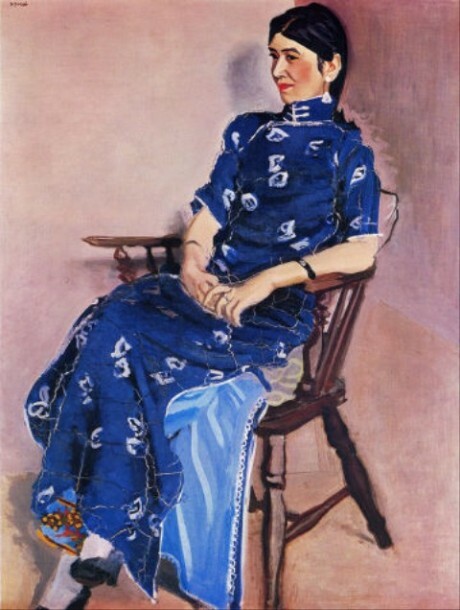 Portrait of Chin-Jung (1934) by Yasui Sōtarō. The National Museum of Modern Art, Tokyo. : Yasui Sōtarō was strongly influenced by the the realistic styles of the French artists Jean-François Millet, Pierre-Auguste Renoir and, in particular, Paul Cézanne. He incorporated clear outlines and vibrant colors in his portraits and landscapes, combining western realism with the softer touches of traditional Nihonga techniques. By the early 20th century, European art forms were also introduced into Japanese architecture. Their marriage with traditional Japanese styles of architecture produced notable buildings like the Tokyo Train Station and the National Diet Building that still exist today. Tokyo Station: Tokyo Station opened on December 20, 1914, and was heavily influenced by European architectural styles. During World War II, government controls and censorship meant that only patriotic themes could be expressed, and many artists were recruited into the government propaganda effort. After the end of World War II in 1945, many artists began working in art forms derived from the international scene, moving away from local artistic developments into the mainstream of world art. Traditional Japanese conceptions endured, however, particularly in the use of modular space in architecture, certain spacing intervals in music and dance, a propensity for certain color combinations, and characteristic literary forms. After World War II, Japanese artists became preoccupied with the mechanisms of urban life and moved from abstraction to anime-influenced art. In the post-World War II period of Japanese history, the government-sponsored Japan Art Academy (Nihon Geijutsuin) was formed in 1947, containing both nihonga and yōga divisions. After World War II, painters, calligraphers, and printmakers flourished in the big cities, particularly Tokyo, and became preoccupied with the mechanisms of urban life, reflected in the flickering lights, neon colors, and frenetic pace of their abstractions. After the abstractions of the 1960s, the 1970s saw a return to realism strongly flavored by the “op” and “pop” art movements, embodied in the 1980s in the explosive works of Ushio Shinohara. By the late 1970s, the search for Japanese qualities and a national style caused many artists to reevaluate their artistic ideology and turn away from what some felt were the empty formulas of the West. Contemporary paintings began to make conscious use of traditional Japanese art. There are also a number of contemporary painters in Japan whose work is largely inspired by anime subcultures and other aspects of popular and youth culture, such as the work of Takashi Murakami. Rinpa school: One of the major historical schools of Japanese painting, created in 17th-century Kyoto by Hon’ami Kōetsu (1558–1637) and Tawaraya Sōtatsu (d. c. 1643). Nitten: The annual Japan Art Academy Awards and the premier art exhibition in Japan. Welcoming the new post-World War II period of Japanese history, the government-sponsored Japan Art Academy (Nihon Geijutsuin) was formed in 1947. The Academy contained both nihonga (traditional Japanese) and yōga (European-influenced) divisions. Government sponsorship of art exhibitions had ended, but they were replaced by private exhibitions, such as the Nitten, on an even larger scale. Although the Nitten was initially the exhibition of the Japan Art Academy, since 1958 it has been run by a separate private corporation. Participation in the Nitten became almost a prerequisite for nomination to the Japan Art Academy. The arts of the Edo and prewar periods (1603–1945) had been supported by merchants and urban people, but they were not as popular as the arts of the postwar period. After World War II, painters, calligraphers, and printmakers flourished in the big cities—particularly Tokyo—and became preoccupied with the mechanisms of urban life, reflected in the flickering lights, neon colors, and frenetic pace of their abstractions. Styles of the New York-Paris art world were fervently embraced. After the abstractions of the 1960s, the 1970s saw a return to realism strongly flavored by the “op” and “pop” art movements, embodied in the 1980s in the explosive works of Ushio Shinohara. Japanese painter Ushio Shinohara paint boxing at SUNY New Paltz, 2012. Many such outstanding avant-garde artists worked both in Japan and abroad, winning international prizes. Some of these artists felt more identified with the international school of art rather than anything specifically Japanese. By the late 1970s, the search for Japanese qualities and a national style caused many artists to reevaluate their artistic ideology and turn away from what some felt were the empty formulas of the West. Contemporary paintings within the modern idiom began to make conscious use of traditional Japanese art forms, devices, and ideologies. Mono-ha is the name given to group of 20th century Japanese artists. The mono-ha artists explored the encounter between natural and industrial materials, such as stone, steel plates, glass, light bulbs, cotton, sponge, paper, wood, wire, rope, leather, oil, and water, arranging them in mostly unaltered, ephemeral states. The works focus as much on the interdependency of these various elements and the surrounding space as on the materials themselves. A number of mono-ha artists turned to painting to recapture traditional nuances in spatial arrangements, color harmonies, and lyricism. Japanese-style, or nihonga painting continued in a pre-war fashion, updating traditional expressions while retaining their intrinsic character. Some artists within this style still painted on silk or paper with traditional colors and ink, while others used new materials, such as acrylics. Many other older schools of art were still practiced, most notably those of the Edo and pre-war periods. For example, the decorative naturalism of the Rinpa school, characterized by brilliant, pure colors and bleeding washes, was reflected in the work of many artists of the postwar period in the 1980s art of Hikosaka Naoyoshi. The realism of Maruyama Ōkyo’s School and the calligraphic and spontaneous Japanese style of the gentlemen-scholars were both widely practiced in the 1980s. At times, all of these schools (along with older ones, such as the Kano School ink traditions) were drawn on by contemporary artists in the Japanese style and in the modern idiom. Many Japanese-style painters were honored with awards and prizes as a result of renewed popular demand for Japanese-style art beginning in the 1970s. More and more, the international modern painters also drew on the Japanese schools as they turned away from Western styles in the 1980s. The tendency had been to synthesize East and West, and some artists such as Shinoda Toko had already leapt the gap between the two. Shinoda’s bold sumi ink abstractions were inspired by traditional calligraphy but were realized as lyrical expressions of modern abstraction. There are also a number of contemporary painters in Japan whose work is largely inspired by anime subcultures and other aspects of popular and youth culture. Takashi Murakami is perhaps among the most famous and popular of these, along with the other artists in his Kaikai Kiki studio collective. His work centers on expressing issues and concerns of post-war Japanese society through seemingly innocuous forms. He draws heavily from anime and related styles but produces paintings and sculptures in media more traditionally associated with fine arts, intentionally blurring the lines between commercial, popular, and fine arts. 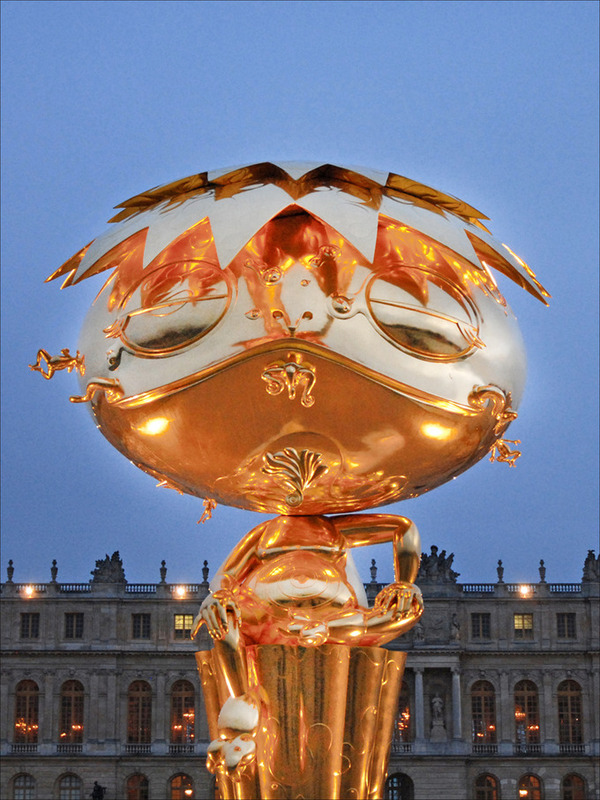 Sculpture by Japanese artist Takashi Murakami at Versailles, France. 2007–2010 bronze and gold leaf. : Takashi Murakami is perhaps the most famous and popular contemporary Japanese artist whose work is largely inspired by anime subcultures and other aspects of popular and youth culture.